My go-to biscuit for the imaginary Julie’s Biscuit Bus is a basic buttermilk biscuit. Really, though, there is nothing basic about this biscuit. Using butter instead of shortening makes the biscuit more tender and much tastier. We ate these biscuits with butter and Ghirardelli Caramel Sauce. Wow! So good! If you read past the recipe you will find Five Julie Factoids. I know you can’t wait. I will be interested to see if anyone knows these facts about me. Preheat oven to 425 degrees. Grease a 10-inch iron skillet. Mix together the flour, baking powder, salt, and sugar. Cut the chilled butter into the flour mixture until combine until mixture is crumbly. Add the buttermilk and mix until moistened. Do not overmix. Place dough on a floured surface and knead 4 or 5 times. I press with my rolling pin so as not to warm the dough with my hands. Roll out to 3/4 thickness and cut with a 2 1/2 inch biscuit cutter. Reroll scraps only once. Place iron skillet in the oven to warm. 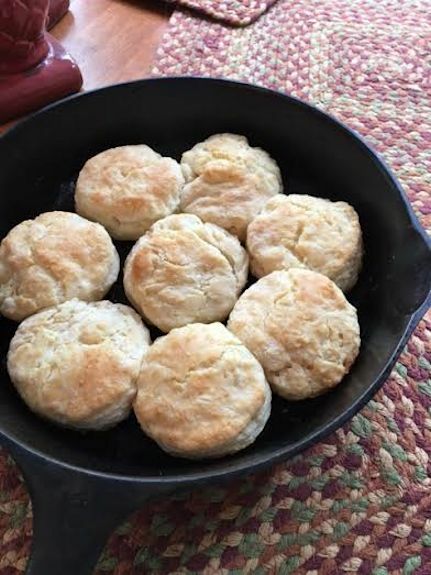 Remove pan from oven and place all biscuits in the pan at the same time and then bake for 17 minutes or until golden brown. Brush with melted butter. Serve hot with more butter, jelly, caramel sauce, ham, sausage, eggs, gravy, grits….they go with everything. Since my post is short I thought I would regale you with exciting tidbits from my very exotic life. Here we go. Which ones did you already know? I started playing the flute when I was 8 years old. When I was six, my first grade teacher brought a flute to school to let us try to play it and then all I ever wanted to do was play the flute. Never underestimate the power of a teacher! I played the flute through college and adulthood. Mostly I play at churches now but haven’t in several years since I joined a new church. Maybe I’ll get back to it soon. The most famous person I ever met was Ronald Reagan when he was campaigning for president. I wrote to him asking if I could interview him for a social studies project. He agreed and we had a telephone interview. Then, a few months later he made a campaign stop in Atlanta and I got to meet him. We continued to correspond and I have several handwritten letters from him. He was a kind and gracious man. I like flowers but I don’t like yard work. Gardening does NOT bring me peace of mind like others claim. It just makes me sweaty and grouchy. My POP (Plant Only Perennials) Policy is in full swing every year until about June when I break down and buy some petunias or geraniums because they are pretty. My favorite perennial flower is peonies. I also like dianthuses. I enjoy making quilts but I don’t know how to make fancy ones. Mostly mine are a bunch of squares in no pattern or design. Personally, I think it’s a bit ironic to buy fabric in order to cut it into small pieces and then sew the small pieces back together again to make one big piece. Am I the only one thinking that? I realize that in the olden days quilts were made from fabric scraps or worn out clothing, however now with the crafting world taking over for practicality, we seem to have lost the purpose of this tradition. One of my favorite places in Georgia is Stone Mountain. I like being up high when I know I can’t fall. What I mean by that is I hate high open spaces and particularly open stairwells but I like being up in buildings or mountains. In fact, I can remember in 7th grade when our class went to Washington, D.C., we rode the elevator up to the top of the Washington monument and then we were supposed to go down the stairs to get to the bottom. My friends dashed on ahead of me laughing and hurtling down the stairs. I got about half way down one flight and then had to physically, literally crawl back to the top on my sweaty hands and sturdy knees. The old wizened elevator guy must have noticed the look of sheer panic on my face and graciously allowed me to ride back down in the elevator. Contradictory as it may seem I feel secure when strapped in a ski chairlift or high up in a tree house, but put me on stadium seats or open stairs and I am a frozen statue waiting to be rescued. I’m off to do laundry. I’ve decided I’m ready to join an underwear camp. I don’t think I could do the whole nudist camp thing, but I would certainly love to wash less clothes so an underwear camp sounds appealing about now. Know of any? This is a fun read….discovered some new facts about you….look forward to your blogs.